Who Wore Splendid Better - Ruby, Suri or Violet? Violet Affleck wore the Pink/Navy Rugby dress by Splendid with matching pink leggings and Navy Canvas shoes by Superga, while shopping for groceries with her mom in Brentwood,CA on July 6th 2008. Ruby once again opted for the Tank version of this oh-so-popular Rugby Dress, which she paired with her favorite Classic Crocs in Navy, while shopping with her parents at Fred Segal on July 6th 2008. 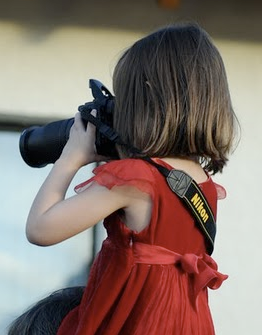 Ruby Maguire is my new "addiction" - voting for her!, tank dresses are my weakness and they simply fit better, rather than those loose tunic styles, both for girls & women. Suri's shoes are out of this league and just dont go with comfy & play-wear look of this Splendid dress. Viloet's safe choice with the leggings is cute, but too much pink imho. 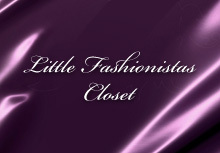 Labels: Splendid Littles, Who Wore It Better? Who Wore Splendid Butterfly Print Better - Ruby, Suri or Zahara? Zahara choose the top to show off this pretty Butterfly Print on April 1st 2008, paired with cargo pants and Checked Slip-ons by Vans Kids. Ruby Maguire wore the tank version of the Butterfly Print in Seashell by Spledid on April 12th 2008, accessorized with her trusty Raeden Sandals by See Kai Run. 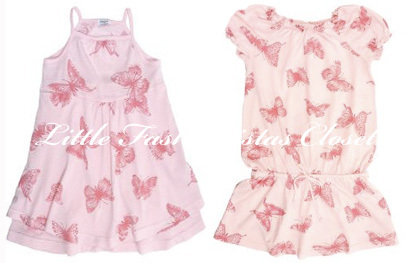 Suri wore the tunic version of this Butterfly Print on April 10th 2010, accessorized with Bunny Slippers and Bunny Ears Headband. Why on earth did Suri need to wait 2 years to wear this adorable Butterfly Print? and i am not a fan of Suri's Easter themed accessories.. might be cute for a party, but definitely not cute for a shopping trip. Thanks to Kat from PopSugar TV for sending me this adorable video! Suri Cruise had a sweet 4th birthday! Tom Cruise and Katie Holmes' daughter celebrated her big day on Saturday with a cupcake party at her Beverly Hills home. Her actual birthday was Sunday. They ordered more than four dozen unfrosted cupcakes from Sprinkles -- plus vanilla and milk chocolate frosting so the tot could decorate them. Suri loves sweet treats. In March, she ditched a dance class to go on a chocolate run with her mom. 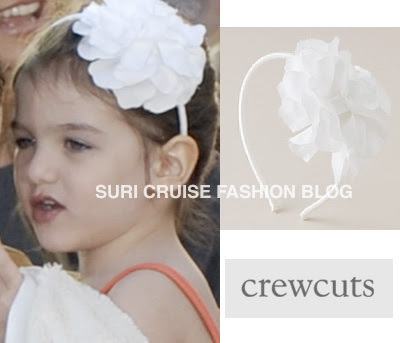 Last year, Suri turned three with a trampoline party in Beverly Hills. Thanks to Jolla, you can check out this article from OK! Magazine about Suri's Shopping Spree. Suri is all smiles and sooo cute in a pink dress! as she their NYC apartment with her nanny on Monday, 12. Suri is wearing Cozy Cotton Tunic Dress in Coral by Crewcuts, and her new favorite Blue patent shoes (most likely from Bonpoint). 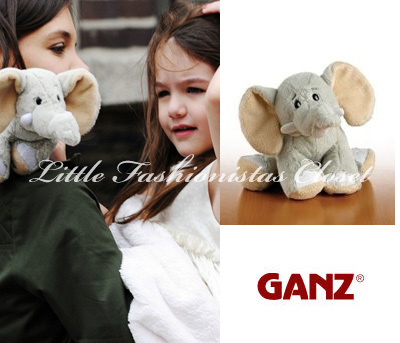 Suri is also carrying her plush friend - Elephant from Webkinz Jr. toys range by GANZ, first seen on April 9th 2010. 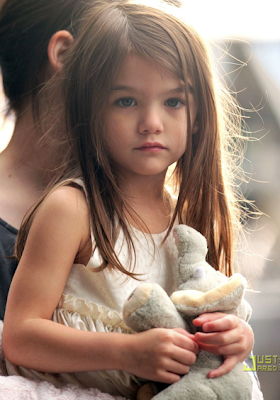 Suri went to visit Katie on the set of "Son of No One" in Queens, NY. Suri takes her nanny to see "Wicked" on Broadway on Monday, 12. Suri & Katie were spotted leaving their NYC apartment on Sunday, 11.
and Barbara Patent Sandals by Maloles Petit, first worn on October 4th 2009. 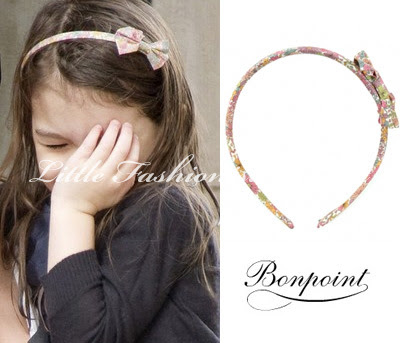 Suri accessorized her outfit with Fleurs Framboise Headband by Bonpoint. or at least pocket looks like that..
Suri and Katie visited the ABC Carpet & Home Co store in NYC on Satruday, 10. - even though the dress is by Splendid (and dont throw tomatoes here - but i consider it a playwear brand) - its not striped! Suri visited her movie star mama Katie Holmes on the New York set of her new movie "Son of No One" on Friday, 9.
but she has a new plush friend - Elephant from Webkinz Jr. toys range by GANZ. 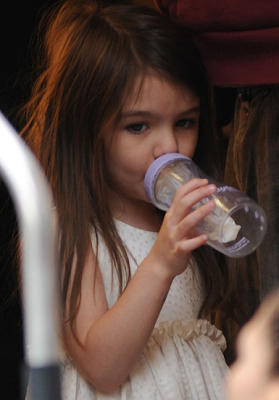 and a new controversial picture of almost-four-year -old Suri drinking from her bottle..
Suri carries a large U.S. Postage envelope, as the duo left their home and headed to Baltazar in Soho for dinner on Thursday, 8. Suri is wearing H&Y white Ruffle Silk Dotted dress and a new pair of Blue Patent Shoes and dark blue socks. 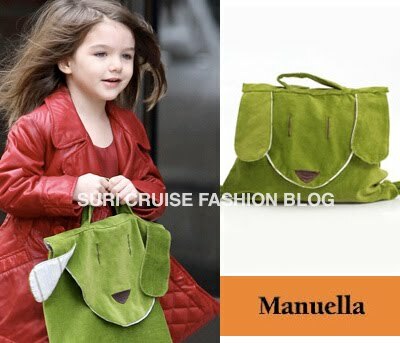 Suri is accessorized her outfit with Green Doggy Backpack by Manuella, first spotted on November 21th 2009. 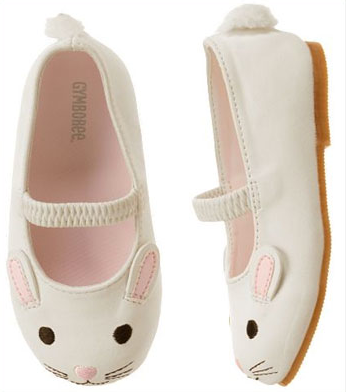 UPDATE: iam 100% sure the shoes are from Bonpoint, purchased earlier. after spending yesterday's morning at Chelsea Piers, S&K continued their day with a shopping spree in NYC on Thursday, 8. Suri is wearing the same Splendid dress as earlier in the day. Suri wore a familiar pair of cosy-piggy slippers as they headed to an indoor play center at Chelsea Piers in New York on Thursday, 8. Suri is wearing White/Heather Stripe Dress with flap pockets by Splendid, which she first wore on April 4th 2010. Suri is wearing Pig Slippers by Happy Feet brand. Suri spotted leaving their NYC apartment with her nanny on Wednesday, 7.
as far as i can tell, Suri is wearing the exact same outfit as yesterday. Suri is spotted leaving Chelsea Piers with her nanny on Tuesday, 6. 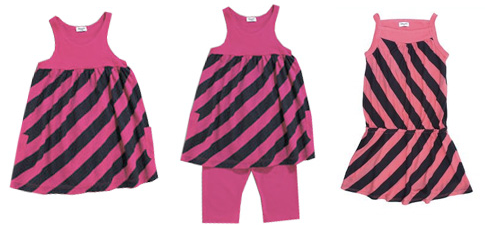 Suri is wearing Pink/Navy Stripe Rugby Dress with ruffle by Splendid Littles. Suri is also wearing her trusty Salina Safari Patent-Leather Ballet Flats by Crewcuts, which she first wore arriving to Tokyo on March 11th 2009. Hey, this is a real cute picture! Suri made a friend while dining at City Bakery on Monday, 5. 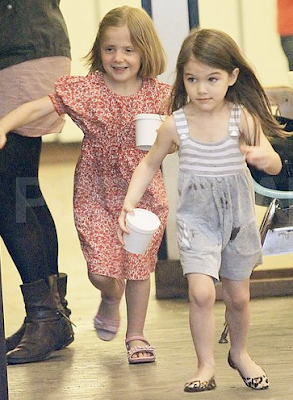 Suri & Katie went to one of their favorite NYC eateries - Alice's Tea Cup, on Monday 5. Today was Katie's first shooting day on the set of her new movie "Son of No One". 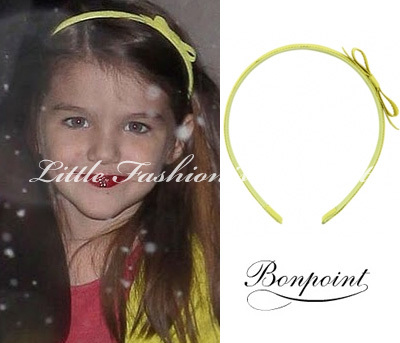 Suri accessorized her "outfit" with Estelle Hairband in Lime by Bonpoint, first worn on February 10th 2010. 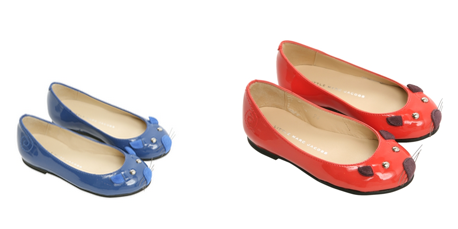 Suri is wearing her trusty Salina Safari Patent-Leather Ballet Flats by Crewcuts, which she first wore arriving to Tokyo on March 11th 2009. Suri & Katie went to catch a performance of DanceBrazil at NYC's Jouyce Theatre on Sunday, 4.
later they stopped by City Bakery Shop for a quick treat. Suri is wearing White/Heather Stripe Dress with flap pockets by Splendid.